Citrus Communis.-It is cultivated chiefly in France, Spain, Italy, Sicily etcetera. It is common in the green-houses of this country. The acidity in the juice is owing to the presence of Citric Acid, the most agreeable acid for effervescing draughts. 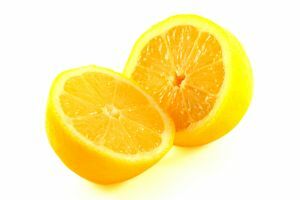 Lemon juice is a powerful and pleasant antiseptic. Dr. 'Wright says, its powers are much increased by saturating it with Muriate of Soda. This mixture he recommended as very efficacious in dysentery, remittent fever, bellyache, putrid sore throat, and as being perfectly specific in diabetes. Citric Acid is often successfully used for allaying vomiting; it is mixed with carbonate of potash, from which it expels the carbonate acid with effervescence. It should be drank as soon as it is made; if not it would do harm instead of good. The doses are about a scruple of the carbonate dissolved in eight or ten drachms of water, and an ounce of lemon juice, or an equivalent quantity of Citric Acid. It is one of the greatest sick-room luxuries that we know; it is of great use in allaying febrileheat, and thirst. The chief medical use of Lemon-juice has hitherto been in scurvy, in which it is a curative medicine, and a preventive; and therefore it is most useful in long sea-voyages. The best way to preserve it for keeping, is to add to it about one-tenth of Spirits of Wine, which coagulates the gummy matter, which would be likely to cause fermentation; and it should therefore be seperated from the clear juice by straining. A little of it should be taken every day when at sea, when fresh vegetables cannot be obtained, during the use of salt provisions. Lime- juice is sometimes used as a substitute, but with less effect. Latterly, Lemon-juice has been employed for the cure of gout and rheumatism with great success. The author has reason, from his own experience, to speak favourably of its remedial power in rheumatic fever. The dose is half an ounce every halt' hour, or hour on an empty stomach. Besides being anti- scorbutic and antiseptic, it is tonic and diaphoretic. As a tonic, it forms with Orange peel an ingredient in the Compound In�fusion of Gentian. In traditional folklore Lemon-juice was said to counteract the effects of Opium. "Salts of Lemon," sold for removing the stains of ink or iron from linen, is wrongly named; for it is a salt of Oxalic Acid, and a rank poison.